Retaining Walls - Avoiding the Downhill Battle - Legends Landscape Supply Inc.
Fight gravity Okay, nothing really fights gravity. But a retaining wall is a vital component towards keeping earth in place. They’re usually found in areas where extra support is needed to prevent earth and dirt from sliding downhill due to erosion (think about retaining walls on highways – then think about what would happen if they weren’t there to keep things in place). Create usable land If you have a slope in your backyard (or anywhere else on your property), then you know that only part of the land is usable. And the other part isn’t, because the slope is simply too steep to build anything on it. A retaining wall can help create a level area in your outdoor living space – thus making your backyard appear larger (and give it more functionality) than before. Handle extra water runoff Retaining walls can also help slow the flow of rainwater (which is critical if you live in a region that’s susceptible to heavy rains). Without a retaining wall, your lawn or garden can be flooded with excessive water. However, a contractor who properly installs a retaining wall helps prevent unwanted flooding and also diverts water to areas which need it (such as a part of your garden which is covered by roof, awning or tree). Need to control downhill erosion If heaps of eroded soil is clogging key areas of your property, you should definitely build a retaining wall. Retaining walls lessen erosion by lowering the angle of a sloping hill and keeping soil in its place. You have a home that is downhill from soil fault lines The principle of a soil fault line is the same as that of an earthquake fault line. It may remain dormant, but at some point, the soil just won’t stay in place. When that happens, it has to go somewhere. 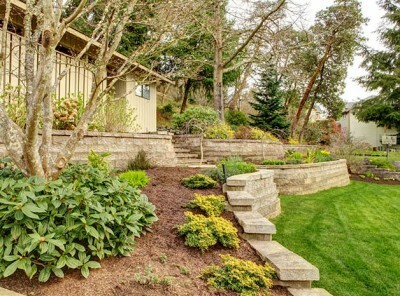 If your home is in the path of a soil fault line, a retaining wall can provide stability and peace of mind. That’s because, should soil tumble towards your home, it will hit the retaining wall before it does your house. Want to protect your home’s foundation Soil erosion can threaten the foundation of your home. If the soil around a downhill foundation is breaking away (or if an uphill foundation is being compacted against by soil), a retaining wall can help. Interlocking stone or poured concrete An interlock or concrete retaining wall delivers multiple benefits. One is that they are built to last for many, many years. Secondly is that they provide a wonderful look and feel – especially if you want to give your home a modern appearance. Natural stone A natural stone retaining wall (while expensive) is usually the most attractive option. That’s because a natural stone retaining wall is full of character. A properly installed natural stone retaining wall won’t buckle, crack or lean. And it can turn any boring corner of your property into an inviting gathering spot. Visit our library: We have plenty of do-it-yourself guides and checklists to help you get started on building your very own retaining wall. Contact us: Tell us what you have in mind for your retaining wall project and one of our landscape experts will be in touch to help answer any questions you have. Written on Wednesday, July 15, 2015.